After a Interim suspension hearing, Alpha Tau Omega will remain on organizational interim suspension – with a single exception to the ruling. The closed-door hearing was held Monday, and in a letter signed by Jim Wilkening, the Interim Suspension hearing officer, it was declared that the fraternity was to remain on interim suspension until an organizational conduct hearing could be held to address the fate of the fraternity. Wilkening specified in the letter that there is an exception to the suspension. 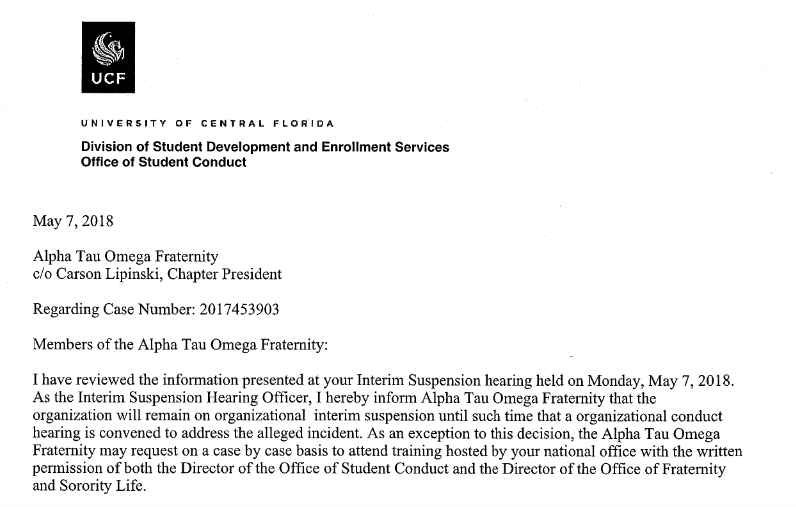 “The Alpha Tau Omega fraternity may request on a case by case basis to attend training hosted by [the] national office with the written permission of both the Director of the Office of Student Conduct and the Director of the Office of Fraternity and Sorority Life,” the letter read. Last month, two UCF students were arrested after an off-campus house party, in which a woman told police the two raped her while she was “black-out drunk,” according to the Orange County Sheriff’s Office. The house where the party took place was the “unofficial off-campus house of the fraternity,” according to an incident report filed to the Office of Fraternity and Sorority Life in the days following the party on April 20. The incident report along with the arrest affidavit for one of the students arrested prompted the organizational conduct action, according to UCF Police public information officer Courtney Gilmartin. This a developing story and more updates will posted as they break.